What Are You Known For? Is it worthwhile? HomeBlogThe BibleWhat Do People Remember About You? When Paul writes to the church in Thessalonica he professes three things he recalls about them. He remembers them and their characteristics before God, presumably as he prays, offering thanksgiving to God for their lives and the examples they provide. Faithful Work: Their faith in God produces their work. They don’t work for the sake of working or do things just to do things. They work with intentionality because of their faith. They couple actions with belief, with their actions springing forth from their spiritual moorings. Loving Labor: Their love for others prompts them to help others. They don’t love in name only or in theory, they show their love by their deeds. For them love is a verb. Because of their love, they toil for others, laboring for the benefit of those around them. Enduring Hope: They persevere because of Jesus, through their hope in him and the promises he offers. This hope inspires their endurance; it motivates them to persist regardless of the situation or circumstances. Their hope propels them forward. When Paul thinks about this church, this is how he remembers them. He recalls their faith, their love, and their hope. 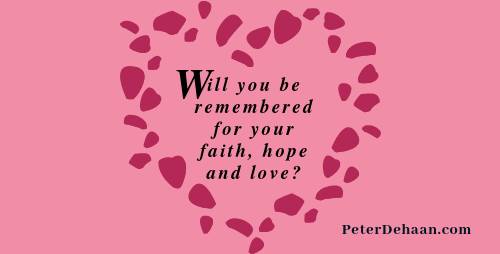 In another letter Paul upholds all three of these ideals and then adds that the greatest of them is love.What Are You Known For? Is it something worthwhile? Click To TweetWhat do people remember about us? How do you love people? Does your faith, love, and hope shine through?